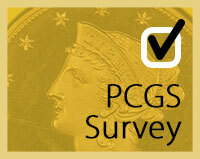 What is Your Coin Collecting New Year’s Resolution? 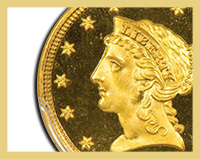 The New Year 2016 will mark two significant anniversaries for the U.S. numismatic community. 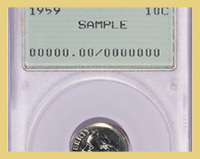 The first is the 100th birthday of three of America’s most beloved coinage designs of the 20th century. The New Year’s second anniversary is a bit closer to home. This is the second finest known 1855 Seated Dollar in existence! 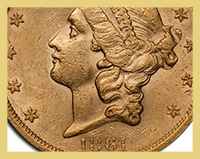 This coin has surprising full booming luster which illuminates the fiery original golden brown/pale reddish gold color. See this outstanding GEM and many more great PCGS coins! 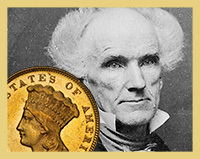 The 1854 three-dollar gold piece was the first coin issue that the Mint's then-chief engraver, James B. Longacre, the coin’s designer, had been allowed to create on his own...and he produced something stunning and truly American. Headlined by a number of exciting coins like this 1896 $2.5 PCGS PR68DCAM, the Regency XV auction sale was one of the largest in Legend Rare Coin Auctions’ 3-1/2 year history. 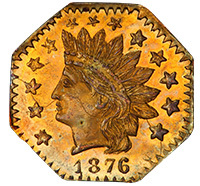 In 1860, Anthony C. Paquet produced a new reverse for the double eagle. It was soon decided that this design would not wear well. A telegraph was sent to the San Francisco mint ordering a return to the old style reverse. This telegraph appears to have taken a considerable amount of time to reach the mint, as by the time it had, $385,000 worth of the new reverse 1861-S double eagles had been struck and released into circulation. L&C Coins What is your coin collecting New Year’s Resolution?